Recently I've considered writing a story co-authored by self and someone from another realm or dimension, someone from the other side. With the purpose of allowing us to see through each other's eyes and to feel with common hearts and understand with like minds. It seems others, not of human form, heard my thoughts, for Shadow Self answered with a visit last night. Shadow talked with me, well more like talked to me. He said that Shadows have 2 sides; he explained the dark side is content with not knowing, while the side facing the light is willing, even eager. to learn. He continued: "When we look in a mirror we see a reflection, but what does that reflection see when it looks back at us?" He also spoke of shadow, born of both light and dark, the true in-between. - But many people think of shadow people as dark, evil, demons and honest, sincere people believe this to be so and for them, it is. "But just for a moment visit the other side and look at humans, light beings, through the eyes of a shadow person. Is what we see as the shadow as horrifying as the way humans see us? Do we also feel threatened? As a Shadow Being, I give you a resounding Yes!" "Many are afraid, and with their fear danger, create real harm, real danger is created. Those on both sides do this. Evil is not light or dark, Evil is the child of fear." Shadow also reminded me about 3 of my favorite "Smart Guys" Plato, Sigmund Freud, and Carl Jung and how they glowed with the light of understanding. He said Plato wrote one of his allegories about a cave, and how that cave influenced both Freud and Jung. He ended our one-way conversation with the simple direction to "go read it" So I did. Basically it’s a comparative tale, speaking of perceptions and shadows. Socrates suggested that perception is based on what we see, while fears are the essence of what we don’t see. He also explains that perceptions are often incomplete unless we are willing to break the chains of what we know and examine the unseen. He then used a parable to explain his meaning. He begins his tale by asking us to imagine that we are chained within a cave facing a blank wall. We have been there since birth, as were or parents and grandparents before us. That cave is our world, it is all we know. We see shadows projected on that blank wall. Yet if we look into the darkness behind us, we see nothing; we realize that shadows only exist when revealed by light. The shadows are our perception of reality. This is our world and we are content. Socrates proposes that if those chains were broken, if we could freely walk about and choose the world we live in, that many will remain in the comfort of our cave and our reality of shadows. Yet many would realize those chains that held them prisoner, were not chains of metal, but chains of fear. That group would leave the shelter of the cave and venture into the unknown and gain a deeper, more complete perception of reality. That cave is our limitations, our boundaries that both self and society place on our thoughts, our actions, and yes, our very being. While many choose to remain bound by fears, many will also willingly take that leap of faith and fly beyond that limited perception of what is. Sigmund Freud was one of the first who attempted to analyze the shadows of the human psyche. His focus was only with the physical side of our psyche; while his understudy and respected friend, Carl Jung included the spiritual self. His second type of Shadow is composed of things rejected for being “too good.” It’s too good to be true so it’s denied. He called the two shadows, the shadow of darkness, and the shadow of light. 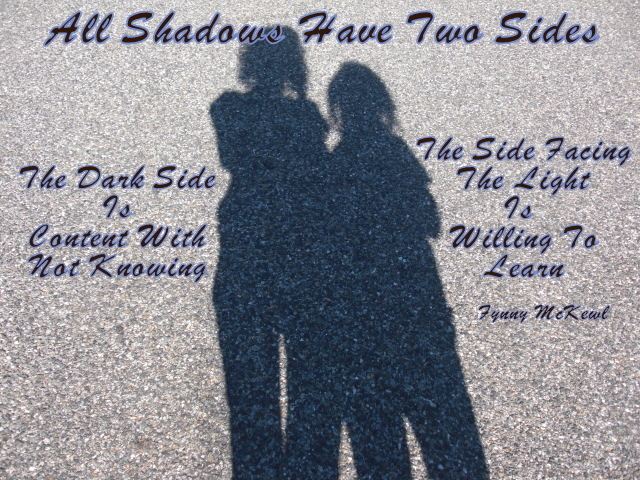 My Shadow Self then presented Carl’ Jung’s view on “Shadows” as representing that part of us which is unconscious, repressed, undeveloped, and denied. Jung says Shadow is neither good nor bad, but simply a way our mind is able to bring into harmony our conscious or visible personality traits with the unconscious and hidden part of self.